One of the first things a new musician learns is that instruments are categorized by family. That is, instruments with similar features are grouped together in a family of instruments similar to them. Families of musical instruments may look similar, or they may produce sound in a similar fashion. Musical families include percussion, brass, woodwind and string. Some instruments fit perfectly within its family of instruments, other instruments, like the piano, may belong to one family or another, depending on whom you ask. In an orchestra setting, families of instruments are often grouped together. That is, string members sit next to one another, and brass instruments are located near each other. The woodwind family includes a number of instruments, many of them popular with school band musicians. Members of the woodwind family include: the clarinet; the oboe; the bassoon; the flute; the recorder; the piccolo and the bagpipes. The flute is perhaps the most popular member of the woodwind family, and is also the oldest instrument in the family. It is believed that the flute made its way to Europe from China during the 12th century, and the instrument dates as far back as 900 BC. The flute typically serves as the soprano voice in an orchestra. The oboe has a range of three octaves, but is difficult to play as it requires a great deal of wind, requiring musicians to learn proper breathing techniques. Another popular member of the woodwind family is the clarinet. The clarinet was invented in the early 18th century by Joann Cristoph Denner, a German instrument maker. The saxophone, which is poplar in Rock and Jazz music, was developed in 1840 by a Belgian instrument maker, Adolph Sax. 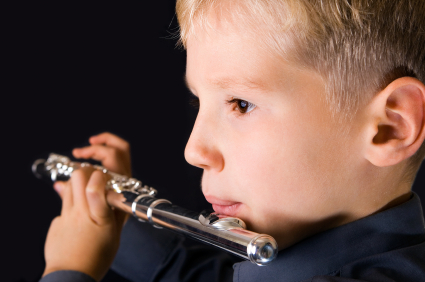 Woodwind instruments are called “woodwind” because the instruments used to be made from wood. Today, woodwind instruments can be made from a variety of materials, including wood, metal, plastic, or a combination of materials. Woodwinds produce sound by blowing into them, either through a reed or through an edge. Sound is produced through vibration. The reed on many woodwind instruments is made of wood, plastic or cane and depending on the instrument, there may be more than one reed used to make noise. Single reed woodwind instruments include the clarinet and the saxophone. Double reed instruments include the oboe and the bassoon. In a modern symphony orchestra there are numerous members of the woodwind family present. A modern orchestra typically includes 1 piccolo, 3 flutes, 3 oboes, 1 English horn, 3 clarinets, 1 bass clarinet, 3 bassoons and 1 contrabassoon.